1) Eliminate food and water sources This is a good first step because it weakens crazy ant colonies, and weakened ants are vulnerable. Eliminating food and water sources will make your other efforts more effective and it will also prevent ant colonies from re-establishing themselves later. Crazy ants feed on sugar, honeydew from farmed insects (including aphids, cottony scales, mealybugs, soft-type scales, and whiteflies), and dead insects. If you have a hummingbird feeder, make sure that it's a model that the ants can't get into or consider leaving it empty for a few weeks. If you have ano-kill bug trap, make sure to empty it regularly or the crazy ants may be able to feed on the captive bugs. Crazy ants can tolerate water shortages, but they breed quickly in moist environments. So, you may want to consider watering less often and draining your bird baths while the problem is dealt with. 2) Block points of entry into the home Your kitchen and pantry are major attractions for ants. When they find bags of sugar, flour, or other packaged foods, it's like finding an open bank vault. They'll rob you blind and then use the resources to breed more foragers. It's a vicious cycle, but you can break it up with a little bit of caulk and fresh gaskets on your windows and doors. As an added benefit, this weatherproofing will also reduce your air conditioning and heating costs! 3) Use the Texas Two-Step Texas A&M University has invented an organic method to eliminate fire ants that will likely work with Crazy Ants. The method will give you long term ant control without harmful chemicals. In 1997, the Texas legislature approved a $2.5 million grant for red imported fire ant research. The research was conducted in the years 1998 and 1999 through the Texas Agricultural Experiment Station, Texas A&M University System, the University of Texas, Texas Tech University, and the Texas Department of Agriculture. The Texas Two Step was one of the results of the research. Later meetings with the National Organic Standards Board helped approve an organic version of the Two Step program, using spinosad as the active ingredient for the first step, and products with a citrus oil extract for step two. With the Two Step technique, you will first widely broadcast an organically approved, non-toxic bait insecticide, and then later treat the individual mounds with organic insecticide. During Step One, spread the organic fire ant killing bait around the affected area. This works best if done in the late summer or early fall. 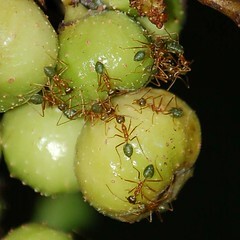 The idea is that the ants will carry the bait back to the nest and when the queen ant consumes the bait, she will either become infertile or die. (You can also put a tablespoon or so of the bait on and around any mounds at any time of the year to improve effectiveness.) Step Two involves applying a non-toxic, organic liquid insecticide to each mound to kill any remaining ants that were not killed by the bait. If you have just a couple nests, you are probably okay using just one type of the organic fire ant controls that we sell. Either one of the products is effective own its own. Ants are social creatures who gather food and store it for the entire colony to share. If you can introduce a slow acting poison or a pathogen that's toxic only to ants, this will wipe them out slowly but surely. The trick is to choose an ant poison that tastes like regular food and doesn't kill fast enough to wipe out the scouts who discover it. Green Light Organic Natural Fire Ant Killer is an OMRI approved option that uses a bacterial nerve agent to kill ants over 1 to 2 days, and it won't harm beneficial insects in your garden. 4) Find the nest and kill the queen It's easy to find the source of ant infestation - just follow the workers home! Even though crazy ants are more likely to wander around, they will still form easily traceable lines if they find a good source of food. You can use these lines to trace the ants path back to a colony and attack them at the source. There are several organic treatments that have proven effective. Digging up the colony with a shovel can also work, but the ants will attack you to defend their home. Another option is to pour boiling water or waste cooking oil on the nest - it works best if you use a long necked funnel to deliver the liquid deep into the tunnels where the queen and vulnerable larvae are found. Crazy ants are unusual because they often form "supercolonies" with more than one queen. Make sure you get all of the queens, or the colony can recover. If you prefer a live-and-let-live approach, you can try putting a barrier along one side of the ant colony to redirect the ants away. Pouring a border of dry molasses along 3 sides of the colony will be somewhat effective at directing crazy ants away from your house or garden, and can be a great option if you don't like one of your neighbors. You can also grow repellent plants around your house to keep ants away - they hate Catnip, Pennyroyal, Peppermint, Sage, and Mint. Tansy can also work, but Tansy is toxic and should be avoided if you have any pets that like to chew on plants (sheep and lambs do this, but so do some dogs and cats). 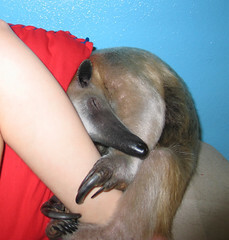 5) If all else fails... Have you considered getting an aardvark? Ant eaters make surprisingly cute pets! Photo courtesy of TamanduaGirl at Flickr.com. Additional suggestions from our readers: Courtesy of Daniel at TheRegister.co.uk: "You forgot what is probably the best method of which I am aware... nematodes. Those parasitic little buggers won't bother the adult ants, but can totally wipe out a colony by eliminating the larvae and queens. Of course, if you've tried chemicals and failed, you're screwed - the pesticide residue will kill off any nematodes you add, and who wants to live with electronics eating ants for a year or two while you wait for the soil concentrations to drop off? Also, while I'm not as confident in it, I suspect that DE (diatomaceous earth) would work quite well as a border control in places where you can keep it dry (such as along the baseboards of your house, especially useful while waiting for the nematodes to do their thing). Just make certain you use food grade DE - pool grade has been treated in all sorts of nasty ways, including high heat that causes the silica to melt and recrystallize, making the dust dangerous to humans as well as insects." We also carry a Diatomaceous Earth spray that can be applied directly to ant mounds. This product isn't a chemical - it uses the physical properties of Diatomaceous Earth to grind away ant exoskeletons. Even though Crazy Ants are resistant to many baits, chemicals, and lures, the mechanical action of Ant-A-Tak Organic Pesticide will wipe them out.